The case continues to interest me, as it does Al. We have shared thoughts and ideas about the case, and neither of us seems ready to let it drop, at least at the moment. As a result of stumbling around for a fair number of hours researching this case, I stumbled across some tantalizing information. Some of that information relates to who might have in fact killed 15-year-old Shandra Charles and her 3-year-old cousin Marcell Taylor in that overgrown field in Houston. Some of the information relates to how one might (and I repeat might) possibly prove Preston Hughes III to be an innocent man on Texas death row. There is much to discuss regarding this case, and the life of an innocent man may hang in the balance. I will therefore take the time and space necessary to carefully detail what I have learned. I will use this post to describe the geography associated with the crime. Understanding the geography will help you understand the how the bodies came to be discovered that night. It will be also be critical to understanding what may have really happened in that overgrown field on the night of 26 September 1988. I will end this post with a tantalizing question for you to ponder as you await the next post in this series. The comments will be open so that you may share your thoughts. For now, however, it's time for a little local geography. 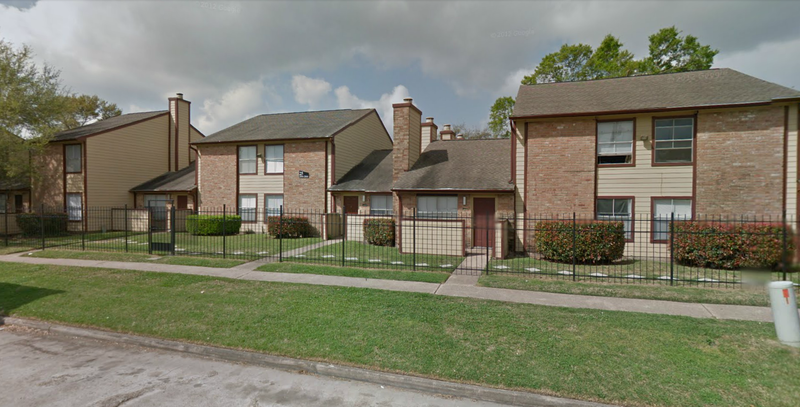 The bodies of Shandra Charles and Marcell Taylor were discovered in a weedy, overgrown field located at the far west side of Houston. More specifically, that field was located near the intersection of South Kirkwood Road and Westheimer Road. That area is shown in the bird's eye view below, courtesy of Bing maps. The annotations are mine. North is to the top, as per convention. The weedy, overgrown field has since been replaced by a series of what appear to be large storage buildings. You can see them as a vertical gray strip of rooftops located just to the left-of-center in the image above. To help you visualize what the geography may have looked like 23 years ago, I have attempted to recreate the field (using descriptions from the police reports) and superimpose it over the map (using the free Photoshop alternative GIMP). I present the result below. According to the scale on Bing, the field was approximately 110 feet wide. There were multiple footpaths through it, running both east-to-west and north-to-south. Of those shown in my recreation, I have reasonable confidence only in the east-west path which includes two white dots (representing the two victims). The trail terminated on the west end somewhere behind Fuddrucker's. 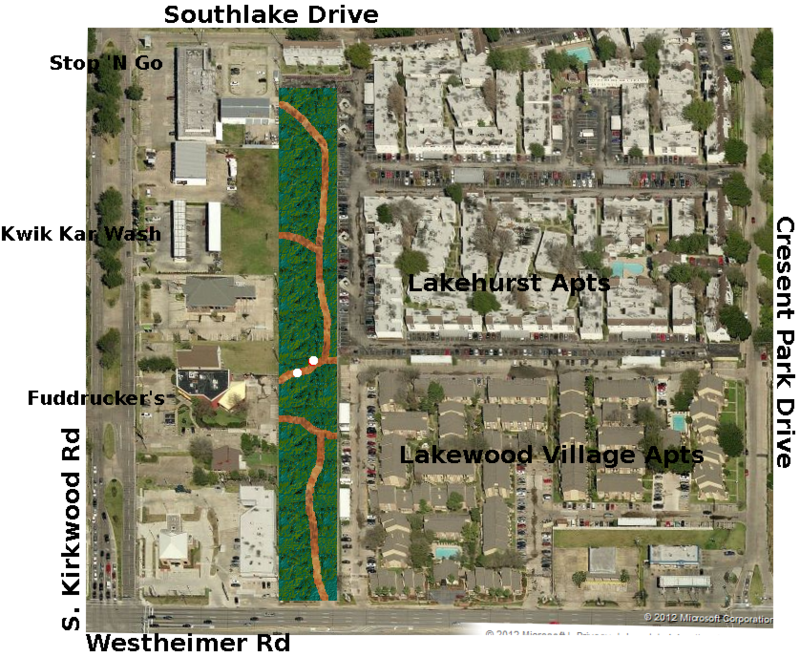 The trail terminated on the east end at an opening in a fence that provided access to both the Lakehurst and Lakewood Village apartment complexes. There are numerous trails through these tall weeds but there are two main footpaths that run generally east-west. The main trail, the one with the most traffic, appears to be the one on the south side ... directly behind the restaurant. There is another well used trail to the north ... that leads from the back of the restaurant to the rear of the two apartment complexes on the east side of the vacant lot. All trails to the south seem to be irrelevant to this case. The unspecified trails that run to the north of the Fuddrucker's-to-apartments are, however, of interest to us. At this point, I have no information about them other than that they existed. The trails as shown are simply as I imagine a few of them. Those two white dots on the Fuddrucker's-to-apartments trail (hereafter known simply as the trail) are the locations where the two victims were found. Victim Shandra Charles was found barely alive near the left white dot. She was directly on the trail. She was face down. Her head was facing to the west, her feet to the east. There was fresh blood about her neckline. She was breathing deeply. She was unconscious. Victim Marcell Taylor was found in the weeds just 2 or 3 feet north of the trail. His head was to the northeast and his feet were to the southwest. His head was turned slightly to the his left. His left arm was extended slightly away from his body. His right forearm was tucked beneath him, near his abdomen. He was not breathing, nor did he have a pulse. The back of his shirt was covered with blood. A wound in the area of his left shoulder was still bleeding. There was at least one other wound, possibly a stab wound, located on the left rear side of his head. The officers turned him over to check for signs of life. His pupils were dilated. They still found no breathing or pulse. They noticed two possible stab wounds to his chest. The front of his shirt was covered with blood, as had been the back of his shirt. 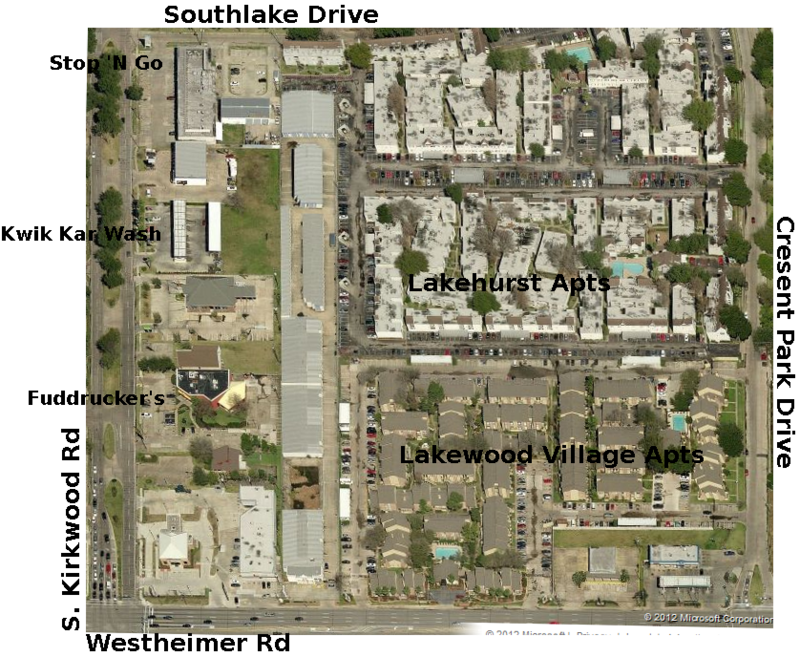 Preston Hughes III lived in the Lakehurst Apartments located to the east of the trail. 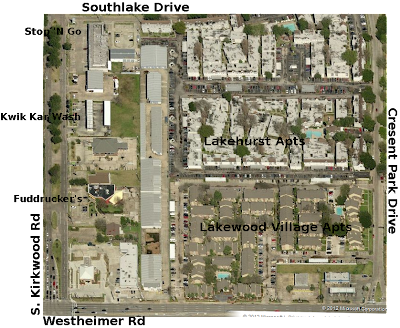 The Lakehurst Apartments are located just north of the similarly named Lakewood Village Apartments. The two complexes were separated by a large wooden fence that ran east-to-west. The trail terminated at the western edge of this fence, apparently allowing access to either apartment complex. Preston Hughes lived by himself in unit 138A of the Lakehurst Apartments. That is an upstairs apartment that overlooks the south end of the complex. That would be one near the large wooden fence. I don't yet know which of the southernmost units was 138A. We can now walk around the block together to get a better feel for the area. We'll begin on Crescent Park Drive to a take a peek at the two apartment complexes. We'll travel counterclockwise and end up at Fuddrucker's where a tantalizing question awaits. 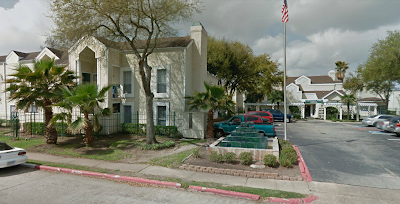 Below is an image of the Lakewood Village Apartments. This is the southernmost of the two apartment complexes. To be clear, this is not the apartment complex in which Preston Hughes lived. The apartments seem middle class and nicely maintained. They certainly leave no suggestion that the area is a crime ridden area. As we continue north along Crescent Park Drive, we get a look at the Lakehurst Apartments. To be clear, this is the northernmost of the two apartment complexes, the one where Preston Hughes lived prior to his two decades on Texas death row. The Lakehurst Apartments give the same impression as before. They suggest a quiet, middle-class, well-maintained neighborhood. Crime of course happens in all neighborhoods, but there seems to be no reason to suspect that this neighborhood was particularly troubled. I don't know about you, but I feel quite safe as we make this walk around the block. We'll turn left at the northern end of the Lakehurst apartments and head west along Southlake Drive. Though lots of names incorporate the word "lake" I don't know of any lake anywhere nearby. There is a large golf course several miles north of here, and maybe that's the source of so many lakewords. Okay, that brings us to the northwest corner of the block. We'll make a quick left turn onto Kirkwood and then we can take a look at the Stop N Go. It seems as if the Stop N Go Up N Went. The address of the Stop N Go from the police report was 2303 South Kirkwood. That corresponds now to The Olde Irish Pub. The Stop N Go is significant because a woman called the police from there that night. She said that she and her husband were walking through the field when they heard someone chasing them. Continuing south along South Kirkwood, we arrive at the next point of interest to us. It is the Kwik Kar Wash, shown below. Looking through the car wash, you can see some of the Lakehurst apartments. You can also see were the weedy, overgrown field used to be. Instead of the field, you see the west walls of some of those storage buildings that were not there on the night of the murder. 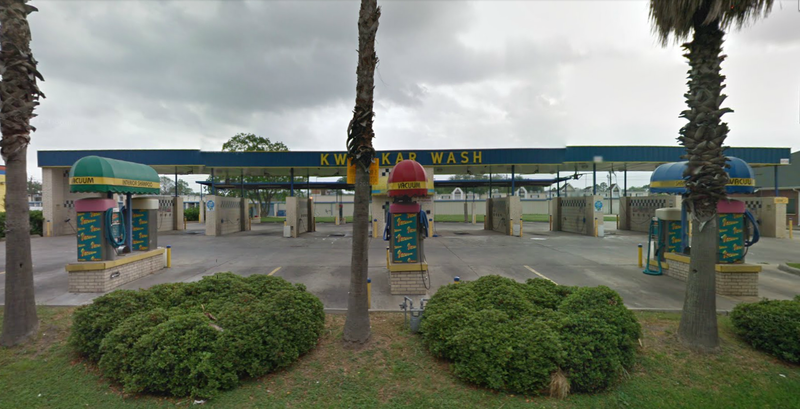 The Kwik Kar Wash is of interest to us because, well, ... uh ... it's confusing. I'll let the police report speak for itself. Officers riding unit 20G40 were flagged down by a person known as Drew Curtis Hartley regarding his wife missing. The time was approx 2330 hrs [11:30 PM] and the location was the Stop N Go parking lot at 2303 S. Kirkwood. Hartley stated that his wife had been walking in a car wash bay located east [I believe that should be south] of the Stop N Go. He stated possibly two black [sic] had abducted her and drug her into the field located south of the Stop N Go: Hartley had a flashlight in his hand and stated that he had been looking for his wife for a while. Good news, everyone. It turns out that Hartley's wife was not abducted by two black men. The police took Hartley in and interviewed him. From the police report of that interview, we learn more about what happened. 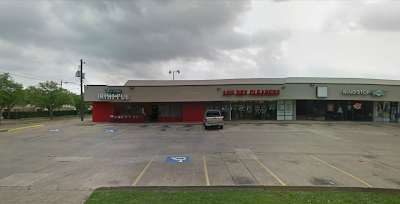 Drew [Hartley] states he and his wife were on their way from the Lakewood Apts to the store, and were walking in the wooded area near a car wash. ... They heard movement in the brush and thought they were being chased and ran to a Stop-N-Go where is his wife called police. Drew lost track of his wife at one point near the car was a short time later, and he began searching for her, enlisting the aid of a civilian and also the officers who were responding to the call. They were able to learn that she had caught a ride with some males in a truck to their friends [sic] apt at the Lakewood project. So Drew's wife was okay, but the police didn't know that at the time. They continued searching the area. Their search carried them further south, to the Fuddrucker's. We'll walk there now. There's Fuddrucker's now. For those of you unfamiliar with Fuddrucker's, it's an upscale burger joint that forces you to stand in line to order your overpriced burger, screams at you over loudspeakers to let you know your burger is ready for pickup, forces you to stand in line for condiments, then detracts further from your burger dining experience by repeatedly screaming over the loudspeakers that burgers for complete strangers are ready for pickup. There, around the back of Fuddrucker's, the police ran into a Fuddrucker's employee. He was taking out some trash. He told the them "She's back there in the woods," pointing to the trail. He said he found her laying there when he was walking home through the field after work. He returned to Fuddrucker's and had the manager call the police. The police followed the trail and discovered first the nearly lifeless body of Shandra Charles and then the recently expired body of Marcell Taylor. Below is a police photograph of the trail along which the murders took place. That leaves me with my tantalizing question for the day. Why was 15-year-old Shandra Charles walking (with her 3-year-old cousin) through a dark overgrown vacant lot (see image above), late at night (after 11 PM), along a trail that connected two apartment complexes (neither of which was her home) with a Fuddrucker's (a family burger joint that closes around 10 PM)? I have a hypothesis. For now, however, I'll leave the question for you to ponder. Feel free to leave your thoughts in the comments. Keep in mind that there are two people dead and one (possibly innocent) person facing the needle in this case. While I do not ask that you constrain your thinking, I do ask that you be discreet as you discuss the possibilities. I got a little confused with the apartments. It one place you said he lived at Lakehurst and the other Lakewood. The spots on the trail would indicate she is coming from Lakehurst and going to Fuddrackers. One question. Did the reports indicate that she possibly had been stabbed off trail and tried to move back to the trail? Good catch. I did say Lakewood twice when I meant Lakehurst. I have fixed those two errors and added further clarifications to help the reader keep track. The trail ended right at the north/south junction of the two apartment complexes, thereby giving access to (or from) both sets of apartments. I can't be sure which way she was traveling. If she fell on her face immediately after being stabbed, then she was facing west when stabbed. If she had been walking up until the point she was stabbed, that would mean she was walking west towards (but not necessarily to) Fuddrucker's. She could have, however, been standing and talking and moving around before the assault. I'm unaware of any evidence or suggestion that she had been stabbed elsewhere and moved to the trail. I think the blood on the ground indicates that she was killed there. I misread the guys report about his wife and thought he got seperated but that doesn't sound like the case. Was there any report on where here car might have been or how did she normally travel? Of all the arguments, geography is the weakest especially at night. I'm not yet making an argument, based on geography or any other matter. I'm simply laying out the geography because it is important to understanding this case. If you're confused about the story told by the husband and wife who claimed they were chased though the field, join the club. I have no idea of their normal means of transportation. According the the police reports, they were walking to the Stop N Go from the Lakewood Apartment complex. According to the police reports, she claimed to have secured a ride home from some males who drove a pickup. I suspect you anticipate that I will be talking about them in greater detail. If so, you are correct. For now, I'm trying to take this in baby steps. I've wondered about why Shandra was walking across a dark lot that late at night. It's complete speculation of course, but Fuddrucker's could have been a place teenager got together to hang out in 1988, so I wonder if she met someone there and was walking back towards the apartments with them when she was assaulted by this person. The thought also crossed my mind that possibly Marcell was found 10-15 yards away because she wanted some privacy at that moment before it turned violent. But I remember when I was 15, and there must have be 1000's of times when I was places that would be difficult to explain rationally since I was constantly in motion at that age without much care or concern. I'm very curious to read more of your thoughts on this. I believe Fuddrucker's was closed. It's a hamburger joint, not a nightclub. Currently, it lists its closing time as 10 PM. Also, the employee who found Shandra was going home after work, and I assume he worked somewhat past closing time. When you were 15 and out late thousands of times, did that include taking a 3-year-old child with you to a overgrown, unlit, vacant lots? 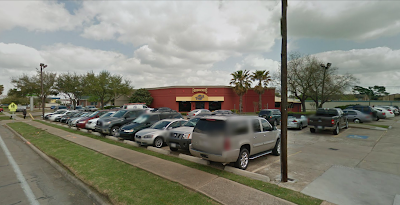 I've eaten at Fuddruckers before & realize its a restaurant. Kids hang out at burger joints all the time, & getting a late night bite would explain why she was out at that time. And, no, I have not or did not take a small child with me those 1000's of times I was out late as a teen :).